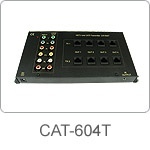 The CAT-604T is CAT5 Transmitter via simple Category 5 (CAT5) UTP cable to transmit Component Video (YPbPr) and Digital Audio or Composite Video and Stereo Audio for long distance connect. CAT-604T connects the source equipment directly; the signals are distributed up to 4 clusters. If it connects CD-104 /CD-108 can be string the more extension outputs on any of the CAT-606R.